As I was growing up the old sayings of ”Patience is a Virtue”, and “Good things come to those who wait” were told to me time and time again. However, if you know me well, “patience” and “waiting” are not words I prefer to have in my vocabulary. I like things to happen “now” and once I have made up my mind about something, I certainly don’t want to wait minutes, let alone years, for it to materialize. Then, in walked Morgan Show horses. Talk about teaching the art of patience and waiting. Although my short history with these great “teachers” (the word I use on a GOOD day) has been a little extreme, I am sure many of you can sympathize with my last few years of personal “education” (another GOOD day word). As many of you may know from early posts, my first Morgan mare was not quite what I expected. 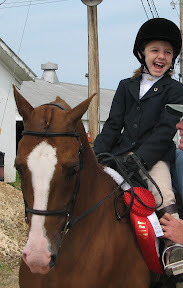 I purchased Scarlet as a 4 year old classic horse and hoped to drive her my first show year and ride her my second. I knew my new bright orange horse wasn’t going to be a Grand National star, but Scarlet was safe, making her the perfect choice for me. After practicing for several months, we hit the ring. Much to my chagrin, however, Scarlet’s driving career fizzled after my first two shows when SHE decided that pulling a cart was just way too taxing; she couldn’t possible work THAT hard. (I distinctly remember the last championship class I drove her in…I was being lapped at the road trot by every horse in the ring. I was clucking my heart out and hitting her with the buggy whip only to have her just plug along like Francis the Mule on downers! Believe it or not, it just got funny by the time we lined up!). Given that I really wanted to ride, we moved onto show season two. Granted, I have had my issues with riding, especially with a full bridle, but once again my little Chestnut princess decided that not only was pulling a cart just too hard, Scarlet also decided that wearing that full bridle was also WAY BEYOND her brain capabilities (trust me, you don’t even want to know what my last Classic Pleasure Saddle class with her looked like…very, very ugly!). Luckily, some friends allowed me to lease their older horse that summer, and HE, God love him, tried to help me learn to ride saddle seat. Looking at her conformation, it was becoming increasingly clear to my trainers that what she was really destined to be was a Western horse. When they told me this, all I could think of was, “Western horse? What the hell do I do with a Western horse? I don’t even like Western riding!” With that, we decided it was time for her to find a new home. In order to accomplish this, we needed to find Western trainers that could finish her and campaign her. Fortunately for us, some very successful Western trainers lived just a few hours away, and had room for her. Scarlet was trained over the winter and had a very successful summer as a western horse. She won several classes, and a couple of championships, some in the amateur division (yes I donned the hat and chaps…I was TRYING to do something with her!) Although we were pretty successful, I still did not like riding Western. We also could not find a buyer for her. Home she came for plan…C, D, E? In an effort to finally find a job for her, it was decided that Scarlet was to be my 8 year old daughter’s hunter mount (yes, she was to be the true “Versatile Morgan”). After my daughter rode her a few times, we realized we had a match made in heaven. They loved each other and that mare took excellent care of her new rider. 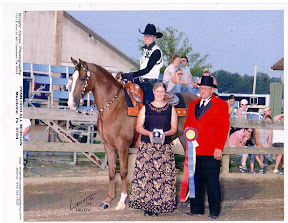 They went to a couple of shows that summer and ended up winning the High Point Walk Trot Championship at the New York Regional. We were finally”there”…or, so we thought. To give Scarlet a little break, she came home to my farm for the winter. We all thought it would be good for her to have some down time and relax. Once spring rolled around, I took her back to the trainers only to receive a phone call the day after I dropped her off. “Scarlet is broken” was the message I was given. At the walk she looked fine but at the trot she was WAY off in her hind stifle area. It was such a bizarre lameness that neither of the trainers had ever seen it nor had I noticed it as she had been hanging out in the field at home during the winter. Home we came for 6 months of imprisonment. I have to admit she took it in stride and didn’t get upset at all about her confinement. However, it was a long 6 months for me and I was eager to get her clean bill of health from the vet. When we took her back up for her re-check, I was all set to just haul her straight to the trainer’s barn. When the vet looked at her, his face said it all; she hadn’t gotten any better and she was now not ride-able. When I asked if she would ever be able to be ridden again in the future, he said maybe lightly but her best bet was to be a broodmare. A broodmare? I didn’t want anymore Western horses! Now what? So, again, home she came. At least now she was able to go out and be a “normal” horse (and I use that term loosely in Scarlet’s case). I had promised my daughter, who already had to get rid of her first horse (another unfortunate story; one of an inappropriate, misrepresented horse sold to a very young girl) that Scarlet would not be sold. Although I really didn’t need another lawn ornament, I couldn’t hurt my daughter and sell her second horse. A few months later, out of a lucky twist of fate, I was able to have Dr. Scott Bennett of Simpsonville, KY examine Scarlet, hoping that maybe, just maybe, there was something that could be done for her. When he looked at her leg and manipulated it, he came to the same conclusion. This time, however, he gave a slightly better prognosis; he said that given time, the leg will heal, could possibly be at least 80% functional or better, and that most likely she could be ridden again (albeit not in competitive shows). Although happy to hear that it would actually heal, I certainly wasn’t holding my breath that she would ever be ridden again; this IS Scarlet we are talking about! She had been home for about a month following Dr. Bennett’s examination, when I received a call from her Western trainers asking if Scarlet would like to come live with them for awhile. They were aware of her injury and were in need of a broodmare for a breeding they needed to use. Happy that she’d finally have another chance to make herself useful, Scarlet made the trek back to New York. When spring rolled around I couldn’t wait for the news that she was pregnant. My daughter was also excited and asked often if the farm had called. We waited…and we waited…and we waited. Finally in late may we got the call saying that Scarlet was in foal. She was making herself useful and we were so happy….until we got the news a few weeks later that she was no longer in foal. So much for that ”job thing”. They tried one more time only to have her come up open. At that point it was too late in the summer to try again. Scarlet was coming home. To add “insult to injury”, my daughter had even decided right before we knew Scarlet was to come home that she now wanted to ride Western. Here we had a perfectly safe Western horse that I knew in my heart would never be able to me ridden. If we hadn’t been used to all the ups and downs, it would have been heartbreaking. Although I wasn’t sure what we were going to do with Scarlet from now on (other than feed her and be at her beck and call), I was happy to see her bright little face again that first day back and have her “say hello” to me whenever I entered the barn. I really did miss her, even though she had become the “baine of my existence” by this time! After she had been home for a couple of days, I decided to really look at her movement, knowing full well that it wasn’t going to be any different. I turned her out and shook a bag at her. As I watched her trot away, it hit me and “OH MY GOD! SHE IS BETTER!” ran through my brain. I watched again and although it wasn’t perfect, it was damn near normal. I later saw her cantering and I had another “OMG” moment…it looked damn near normal too! Could it be possible that even if my daughter couldn’t show her, she could at least learn on her? Talk about crossing ones fingers (and toes)! Within a couple of days I was able to talk to Dr. Bennett and discuss the possibility of riding Scarlet again. Still thinking he was going to say that riding her at this point would either be dangerous to my daughter or would cause re-injury, I was ecstatic to hear him say “No” to both points. He thought it had probably healed as much as it was going to and that we could ride her as much as we wanted. That is for sure patience and perserverance, kudos to you all! Believe it or not, there is actually more to the story. It was too long to begin with so I just hit the “high” points (or low points, as the case may be!). There were many, many times I wanted to just give her away but she really has a way of just hanging out in your heart. She is something else. I will put some pics of her later today. I really can’t wait to hear the rest of the story. I thought I had patience in the horse world but you have me beat. I’m rooting for “Red”…I just love that mare. When I heard about her losing the foal, my heart just dropped. Though I hadn’t said anything to the “trainers”…I was hoping that she would have a colt, that it would be for sale, and that would be my next western project. She’s probably just smarter than the rest of us…she wanted to be back home, with her “little girl.” The heck with everyone else’s plans for her! You know, after seeing my daughter grooming her yesterday and seeing Scarlet just keep turning and looking at her, I think you might very well be right. Maybe there will be colts in the future for you when she is done teaching her girl to ride western…one never knows with Scarlet! If and when she has that colt…I’ll be the first one at your door wanting to have a look! For right now…she has the most important job in the world…helping your daughter discover the joy of Morgans. Finding the right horse to trust with your child can be like finding a needle in a haystack. You were lucky to have the needle come find you! I just added a couple of photos in case anyone is interested in what my little “Red Devilette” looks like. Just an update…I rode Miss Scarlet today. She wore a saddle and bridle for the first time in about 3 years and she did great! I was so proud of her. She was not particularly HAPPY about the situation (I think she would have said “Are you kidding me?? ?” if she could talk). We walked around a little as I think it is going to take awhile for her to build up her leg again. She didn’t buckle or seem uncomfortable, just alittle unsure, for lack of a better word. Like they say in Vegas…always bet on “Red”. Glad to hear she’s doing well! I have to admit, just walking her around for 10 minutes probably ranks up there in my list of “Best Rides Ever”. Scarlet is very cute!! I hope her injuries stay healed and good luck in ’09!! Thank you. She really has a place in my heart…now (not so much early on!). Believe it or not, we are now cantering and she is really doing well. It isn’t the pretties canter around but she will definitely be strong enough for the small local shows for many years to come. Needless to say my daughter is thrilled! I hope to post some video next week following their first local winter tournament show this Sunday. Glad to hear that “Red” is doing so well. I can’t wait to see video from the tournament.